Amsterdam is renowned for being very dog-friendly. Any visitor can attest to this as dogs are everywhere! Many businesses including restaurants and bars will allow dogs inside. If you don’t see a “no dog” sticker at the entrance, then most likely they’ll be allowed. When in doubt – just ask – it won’t be the first time they’ve heard that question! Dogs are not allowed in any of the major museums or churches but are allowed pretty much everywhere else. Dogs of any size are allowed on the public transportation system including trams, metro, busses and trains. Dogs are allowed for free on all types of transportation except for trains which charge a 3 euro dog day ticket fee. During the summer is the best time to take your pet as the city comes alive with outdoor terraces where your dog will be permitted even if they’re not permitted indoors. There are quite a lot of dog-friendly parks that are great for those long summer days including Vondelpark, Flevopark, Westerpark and Oosterpark amongst others. Flevopark even has a swimming area for dogs in the summer! You are supposed to pick-up after your dog wherever you are in Amsterdam but you rarely see dog owners doing this. I always picked up after my dog and had a number of Dutch residents thank me for doing so. It’s just not nice to leave a large lump of poo on the sidewalk (or next to the trees which is where my dog used to go). Some dog owners don’t seem to notice, or they pretend not to. But be respectful to others and just pick up after your dog. Dogs are seen off the leash throughout the city. I wouldn’t recommend this for visitors as your dog could easily get hit by a bicyclist, car or tram. There’s plenty of running around room in the parks where you can let them off the leash on big grassy areas, if you trust your dog enough to do so. They’ll be sure to meet other dogs in these parks as they are very popular with dog owners who let their dogs run free. Technically, I think there is a leash law in Amsterdam but no one seems to follow this rule. 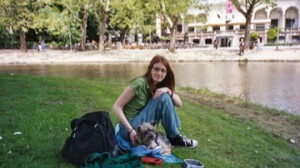 Many hotels in Amsterdam, and the Netherlands, allow dogs. Most have some type of restriction – either for the weight of the animal or the number of pets allowed per room. If you need help in finding accommodations just fill out a Contact Request Form! Amsterdam truly is a dog-friendly and dog-lover city. 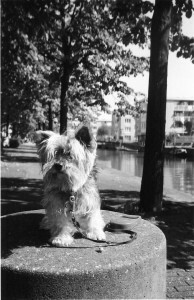 Perhaps I’m biased – my dog is Dutch after all – but we never had any problems with taking him around the city, or the country, with us. He especially loved riding the trams and getting to watch the world go by! For more information or assistance with planning a trip to Amsterdam, please email me at Leila@WorldClassTvl.com or fill out a Contact Request Form. I am moving to Amsterdam in Jan 2014. I will be taking my staffie called Bruce with me. I am looking and finding it slightly hard to find any hostels that accept dogs. I need a hostel for a few days while i get a job and find a place to live. If you have any tips please let me know. Time is running out and I’m not getting any results.